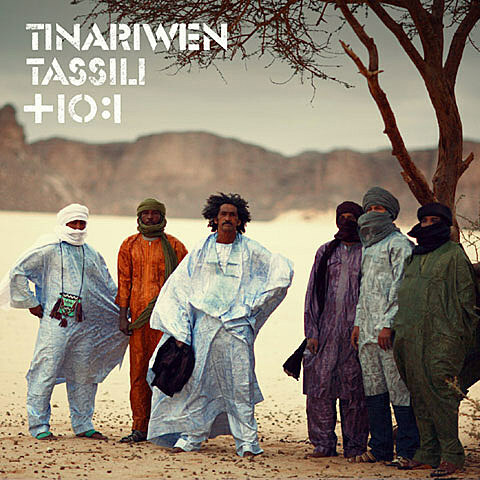 Tinariwen will release a new album called Tassili on August 30 via Anti- Records (pictured above). The album was recorded entirely acoustic with contributions from Tunde Adebimpe & Kyp Malone of TV on the Radio, the Dirty Dozen Brass Band, and Nels Cline of Wilco (who plays a show with Marc Ribot at LPR on June 15th). Tinariwen will head out on a short North American tour in July which will hit the Winnipeg Folk Festival and the previously mentioned Highline Ballroom on July 20. Tickets are still on sale for that NYC show. Tinariwen also play the Finger Lakes Grassroots Festival on July 21 at the Trumansburg Fairgrounds in Trumansburg, NY (which runs from July 21-24). There they share a bill with Donna the Buffalo, Court Yard Hounds, Seun Kuti & Egypt 80, Balkan Beat Box, Sammy Kershaw, Thomas Mapfumo & the Blacks Unlimited, John Brown’s Body, Carolina Chocolate Drops, Giant Panda Guerilla Dub Squad, and many others. For Seun Kuti, the Trumansburg date is one day after he plays a free show at the Prospect Park Bandshell. Seun recently sent out an updated list of tour dates too, and a new video you can watch below.